Ft. Lauderdale, FL- January 23, 2019 - New Day Consulting Systems (New Day) announced today that its South Florida offices will be located in downtown Ft. Lauderdale, Florida effective February 1, 2019. The company's headquarters were in Reston, Virginia for the past five (5) years. New Day is a global business and franchise strategy firm that works with businesses to effectively scale via franchising, intellectual property licensing, funding and matchmaking. The CEO, Kimberly M. Bonner, is a fifth (5th) generation Floridian, Broward County native and is excited to bring New Day to Broward. "South Florida's entrepreneurial environment is quite vibrant right now. Businesses are looking to scale both domestically and internationally. So, I am elated to be back in South Florida and contribute to the community that gave so much to me as a child." One of New Day's clients, Regal Maid Service (Regal), is looking to expand its presence in Dade, Broward and Palm Beach counties. To that end, Regal will participate in the International Franchise Expo South (IFE South) at the Broward County Convention Center January 24-26, 2019. IFE South is one of the premiere franchise conferences in the U.S. and is a wonderful opportunity for prospective franchisees and investors to get more information about franchise brands and attend various educational seminars. The CEO of Regal Maid Service, Joanne Hollindrake, will be at IFE South and looks forward to answering questions at the event. Joanne Hollindrake was recently recognized as a "CEO You Should Know" in the Washington, DC region for her work and leadership of Regal. She is looking to expand the Regal franchise in key areas like South Florida, Texas, Georgia, California and Maryland. Joanne and Tim Hollindrake are originally from England. 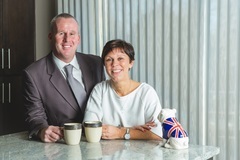 They started as Regal franchisees and soon became the leading franchisees in the system. Due to their success, the Hollindrakes were asked to lead the entire franchise system in 2015.